We sell these here. Drawer front mounting brackets. Attach this "clip on" bracket to your drawer front with screws, not included. 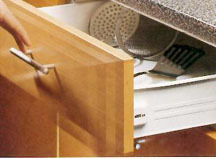 Your prepared cabinet drawer front can now be "clipped" to your drawer box as shown. The 2 screws shown above on the left are used for adjusting the front to keep it straight with the kitchen cabinets. If you ever need to remove the drawer front from the metal sides / slides, turn this screw in the direction shown on the bracket. Cut the drawer box bottom and back 31mm (1 1/4") less then the cabinet drawer opening. This system is very fast and can be done by amateur woodworkers and most home owners. If you cut the bottom too big, of course your drawer box will be tight in the cabinet, if this were a wood dovetailed or plain old wooden drawer box you will be in trouble. With this system, just take it apart and re-cut the bottom/back to fit. Re-screw it back together in same holes and try again. ( screws not included ).... This is quite handy in a re-face job where everything in the kitchen is not square. The drawer sides are one half of the slide and another piece fastens to the cabinets so no need for extra slides. Your finished job should look like this.